The book I'm going to read tonight in bed is 'Party of the Century: The Fabulous Story of Truman Capote and His Black and White Ball' by Deborah Davis. The year was 1966, and the only place to be on the night of November 28th was the Plaza Hotel in NYC. 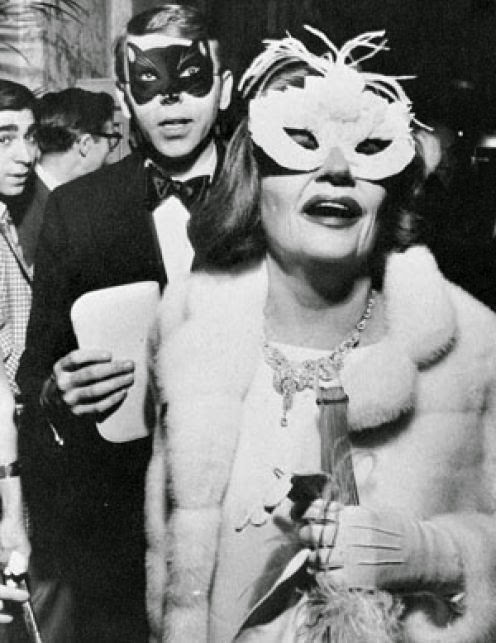 Everyone wanted an invitation but only select 540 got the chance to be there and rub shoulders and masks with the likes of Frank Sinatra and his young wife Mia Farrow, Lee Radziwill, Lauren Bacall, and Tallulah Bankead (above). which brings us to the question: What perfume would you wear to such an event had you been invited? Tonight my answer is Tuberose Tobacco Cognac from the House of Cherry Bomb, the collaboration of two NYC perfumers Maria McElroy (Aroma M) and Alexis Karl (Scent by Alexis). It seems like a good fit: dark as a night, warm like a plush ballroom, rich and heady as the atmosphere of the most coveted event of the century. We can only guess that the air that night was thick and heavy with smoke, booze, and hundreds and hundreds perfumes from an era before sillage became a dirty word. The white ball gowns of the ladies were created by the likes of Dior, Givenchy, and Halston. The scents probably matched the fur coats and dazzling jewelry. And Tuberose Tobacco Cognac, with its swirls of heady aromas, boozy and floral, tough and soft, would have been right at home. The first thing I get from this Cherry Bomb is tuberose. You must love this note and love it dearly to enjoy Tuberose Tobacco Cognac, but that's pretty obvious from the name. The soaring femininity of the narcotic flower is counterbalanced by the full-bodied honeyed cognac and the even more honeyed yet mellow tobacco. On my skin it doesn't smell particularly smoky, just very thick. It's like an old box that's still redolent of sweet tobacco than the actual material. There are other floral threads woven into the perfume's body, all intoxicating in the height of their bloom. This goes well with the touch of animalic that leads into the dry-down: dirty musk, skin-like ambergris, the smell of the warm bodies dancing the night away at the Plaza. Tuberose Tobacco Cognac ($75, 1 oz EDP) is one of the atelier perfumes offered by the House of Cherry Bomb. It can be purchased in person at the studio (10th floor at 68 Jay Street, Brooklyn ) or through the Etsy store (I highly recommend ordering the sample set or the discovery set). Link provided for your convenience only and I'm not compensated in any way, shape or form.The perfumers provided the sample for this review. To read more about Truman Capote's party check out this blog post on Fashion's Most wanted. Photograph of Tallulah Bankhead arriving at the ball by Henry Grossman. Gray, frigid, horrible day here. But just reading your review about this scent is a perfect antidote. And finding their etsy store - heaven! Everything they have sounds brilliant. Just ordered the discovery set. Also need to read that book. The Black and White ball has always fascinated me - the fashions, the desperation for an invitation (would love to see his notebook with all those names added and also deleted), the decor, the unusual menu, etc. But I also would really love to know what the overall scent of the party that night was like - wonder if anyone has ever written about that. It's a great book, I'm actually thinking about re-reading it(read it a few years ago for the first time). The perfume sounds great but I'm don't adore tuberose. For an event as "The black and white-ball", had I been able to go, I would probably just have rinsed my hair in orange blossom water like they do in Lebanon( and worn really extravagant jewels).